Week two is in the books and the Berlin Marathon is only 4 months away! That seems like a lot of time, but I know it will go quite quickly. This week was one of those long short weeks – you know one of those weeks where Friday takes forever to arrive? But all in all it was a good week of running and I continued to take advantage of the buildup in miles! You can find these training recaps each Sunday and please do join in the link up! Monday: I was supposed to have the day off running but I needed to run a couple errands so I ran my errands. 1.25 mile run total – I picked up the pack I will take with me to Berlin, so that was fun! Tuesday: 4.38 miles from work to (and including) the Whole Foods Run Club. Another fun run with that group! Thursday: A 2.57 run commute TO work. This was the first time I’ve run to the office and I liked it – although it ended up being a bit stressful because I was running late for an appointment. But outside of that, it was nice! Friday: We brought back the Pure Barre run club. Dawn and I ran a few miles and then immediately went to Pure Barre. Ouch! That class kicked our butts!! I’d forgotten how hard it is to run and then take barre immediately afterwards. Saturday: Zooma Annapolis 10k! I love this race weekend and had SO much fun with my friends. We didn’t race it but ran relatively easy – not as easy as I’d planned, though. 54:38 final time, with an average pace of 8:48. That’s a bit faster than my goal marathon pace and it felt like work. I know some of that was hills but some of it was the fact that I’m just two weeks into training. I’m excited to continue to build fitness! Sunday: 3.74 miles with Deb – we started a bit late (which was nice) but that meant it was HOT! Anyone else race over the weekend? Tell me about it! Another great week of training – congrats! It’s so cool that you have different run clubs to meet up with during the week – they both sound fun, especially Whole Foods! Great job at the race on Saturday! I’m thinking of adding that half marathon to my list of races next year! I haven’t tried a run commute to work yet. But I’m sweating even when I bike or walk in and have to clean myself up, so running won’t be that much worse. I think I’ll try it one day. And I love that you ran for your errands! I’d like to hear about the pack you got! I have a shower, so I can get ready at the office. Otherwise, it’d be a no go for sure! I got this pack: https://www.rei.com/product/894562/osprey-farpoint-40-travel-pack – I’m excited to take it to Europe! Sadly there are no more ZOOMA runs in the Chicago area. Another great week for you! I like how all of the runs are “easy” before heading to speed and tempo workouts. I’m going to try run commuting from work this week, I think! I only live about a mile away so I’m just going to leave from work, run around downtown to get in my miles, and end up at home, rather than coming home first and then going back out for my run. In my mind that’s more time efficient (and I am all about maximizing my time this training cycle), but we’ll see if that’s actually true. Congrats on a fun race and a great time! I know that sometimes I just need a good race here and there to break up a training cycle. That’s awesome you ran to work! I love that you can do that! It is a nice option to have – I very much appreciate the flexibility I have in running to or from work. For some reason holiday work weeks always drag on! So glad Zooma was so awesome this year! I’m always afraid to sign up because of the heat — although the one year I did it, it wasn’t too bad. It’s normally way too hot but we got really lucky with the weather this year! I sometimes run home from work (never to – no showers! ), and even though it’s super convenient, I really dislike doing it. I’m always so sluggish and the point to point route feels so long! But it’s a great way to work in miles on a tight schedule, and it beats sitting in traffic! The 4 months are definitely going to fly – it’s already flying. I can’t believe you’re two weeks in already! i just started today for Chicago. It’s funny how training can seem so long and so fast at the same time. Have a great Week 3! Oh I love my run commute days! I won’t be doing it a ton once training gets really intense, but in the interim it’s an easy way to get in miles! I have a number of friends running Chicago and most are starting their plans this week. 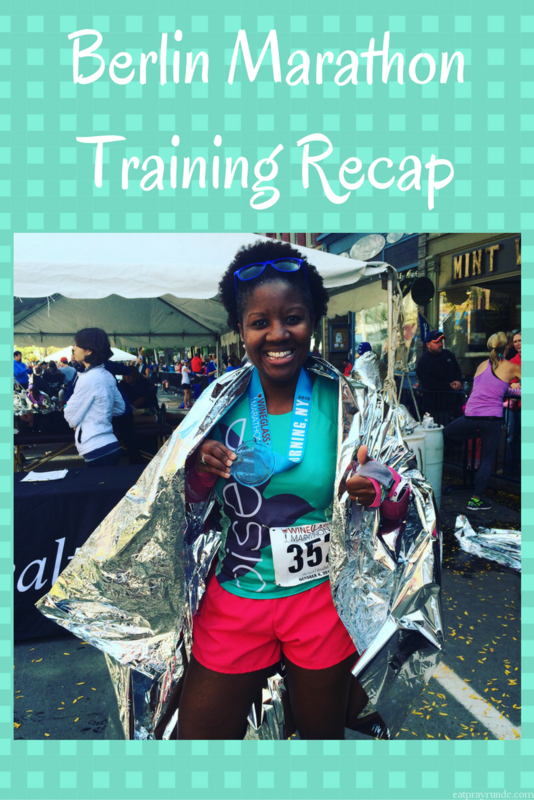 Marathon training is here! Tanya recently posted…Developing Work Teams: Which Member of the Band Are You? It was so great to see you this past weekend! And with my training starting today, I’ll be starting to link back up again! It’s great you are able to run on your commute to work! AND that you’ve got a few run clubs to run with too! Nice job on the 10k btw. Hilly courses make for great strengthening workouts!!! Thank you! FYI – your blog is saying “permission denied” – I can’t access it! I have no doubt that you are going to crush Berlin! You’ve been running so well. I expect nothing less! Hooray for a great week of training, run commuting, and sharing some runs with friends. I actually think it’s awesome you run commute and that seems like a good distance. I know splitting up runs isn’t ideal for training, but it seems like a good way to get some easy miles in on shorter days. Also, I love that you worked the 10K into your training as a MP run- that is a good way to use a race as a training run so that you’re not super tired for training the next week and get practice at that pace (which is really what Hansons is all about). I’m jealous that you can run commute! I work 25 miles away from home and no showers! Lol. I love all your group runs and meet ups too. Congrats on a great week of training and fun 10k! I so hear you on the long short week – I always find the week after a long weekend drags a bit. Looks like another solid training week for you! It’s great that you can run commute!